A coalition of Muslim and Marxist-led groups won the November 12, 2017 Alabama Senate election for Doug Jones. The activists consisting of Muslims, Hispanics and mainly Black Christians formed a group called the “Stand As One Coalition.” After the election, representatives from the groups bragged in a press conference about making 63,880 robocalls, making 8,776 direct phone calls, knocking on 10,180 doors, delivering 54,600 mailers and engaging in “faith based preaching” to over 7,000 people for candidate Doug Jones. 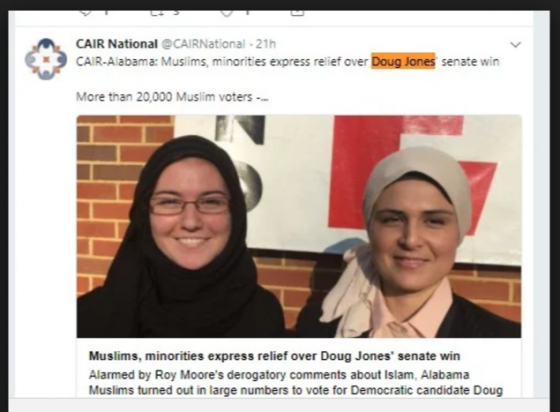 “More than 20,000 Muslim voters – about the margin of victory for Jones – turned out and voted almost without exception for Jones, said Khaula Hadeed, executive director of the Council on American-Islamic Relations in Alabama. Hadeed joined other minority leaders at Greater Birmingham Ministries on Thursday December 14, who worked to get out the vote in an election that brought together the most marginalized groups, they said. “It took a whole group of us working together,” said Isabel Rubio, executive director of the Hispanic Interest Coalition of Alabama. “We touched as many people as we could,” said Scott Douglas, executive director of Greater Birmingham Ministries, speaking on behalf of the Stand As One Coalition. Coalition leader Scott Douglas and his Greater Birmingham Ministries have been a major political and religious influence in Alabama’s Black communities for decades. In recent years, Douglas has been associated with Freedom Road Socialist Organization (FRSO) front groups, such as the Rockwood Leadership Institute and the Pushback Network. The FRSO, with their close ally Democratic Socialists of America (DSA), this country’s largest Marxist organization, have been running radicals posing as Democrats all across the South. Some examples of these radicals-posing-as-Democrats include DSA member Lee Carter, who recently won a delegate seat in the Virginia house against a top-ranking Republican incumbent, DSA-backed Randall Woodfin, who recently won the mayoralty of Birmingham, and FRSO-backed candidates, Chokwe Antar Lumumba, who won the mayoralty of Jackson, Mississippi and Andrew Gillum, the current mayor of Tallahassee, who is currently running for Governor of Florida. Scott Douglas’ old comrade John Zippert also helped win the crucial Alabama “Black Belt” for Doug Jones. The numbers show they got the job done well. As the vote totals rolled in, Selma — the site of storied civil rights and county seat — supplied the coup de grace, delivering nearly 75 percent of Dallas County’s votes to Jones. You could see the movement’s force in Greene County, near the state’s western edge. The area was a hotbed of civil rights activism in the 1960s, when Dr. King and his top lieutenants paid multiple visits. The torch later passed to local leaders like John Zippert and Carol Zippert, who have spent decades running programs for an organization, the Federation of Southern Cooperatives, that helps black farmers get access to credit and land. The Zipperts also publish a newspaper, the Greene County Democrat, that urged voters to the polls. The county seat, Eutaw, features a casino, Greenetrack, whose CEO is Luther Winn, a politically active businessman who supports the local NAACP and the National Action Network, the organization run by the Rev. Al Sharpton. Thanks in part to the efforts of Winn, the Zipperts and NAACP activists, Jones carried Greene with an overwhelming 87 percent of the vote, a larger margin than Moore won in any county. John Zippert, his newspaper and his “Federation of Southern Cooperatives” was a major part of the winning Jones Coalition. Like Scott Douglas, John Zippert also comes out the communist movement. If scandal had not dogged Roy Moore’s campaign, Doug Jones would likely have lost the November 12 election by 10 or more points. The left smelled blood in the water, so they threw everything they could at the race. Their efforts paid off. The takeaway from the 2017 Alabama Senate Race is not poor Republican messaging, or poor vetting. They were important, but they were not the deciding factor. The real lesson is that the left is pouring big resources into registering hundreds of thousands of Black and Latino voters in Southern states – especially North Carolina, Florida, Georgia, Texas and Arizona. They have already flipped Colorado and Virginia, if they can push over two or three more Southern dominoes, the Republicans will be in deep trouble. If Alabama’s Muslim and Marxist communities had not rallied thousands of Black, Latino and Muslim voters behind Doug Jones, President Trump would be sitting on a safer Senate majority today.